We used to say that to our children for a job well done. Now it is preserved for our animals. 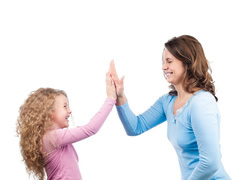 WebMD has a great general article on how praising behavior has changed in this generation. We are to praise what the grandchildren do, the process, rather than end result. After all, how many of our grandchildren athletes will become professional? P.S. I know mine will (I should put a smiley emoji with heart eyes here). She goes on to say the idea of praise changed again in the 1980’s and 1990’s, when we Boomer grandparents were almost done raising our children, and then “some scholars started to argue that praise can undermine children’s motivation, create pressure to continue performing well, discourage risk taking, and reduce independence. At the time we were near the end of our hands on parenting of our own children, scholars felt praise was harmful, actually a form of manipulation to get children to do what parents want and get our approval. Frankly, this Grandma sees nothing wrong with that. I now remember that we were beginning to be told as parents to use “disappointment,” that we were disappointed at certain behaviors we found should not continue. I do remember telling my then teenager how disappointed I was in her behaviors. It did nothing. But, maybe it was that teenager. So, how are we to praise our grandchildren today to conform to current norms? I always say current norms because a new study could come out tomorrow (like the new ones on breastfeeding) and we may be able to go back to praising our grandchildren as we do our animals. Here is the difference of praising the person and praising behavior and why and how we are supposed to praise behavior, not the person. So, if our toddler draws fabulous swiggles, and of course, all of their swiggles are fabulous, we say, “you used a lot of bright colors in your picture.” If they used only black, gray, and brown, contact a parent immediately. If the toddler makes a tall tower with blocks, we just comment on how tall it is. We communicate about the tower. If they share with a sibling, we acknowledge that behavior, and according to Lauren Lowry, we are promoting the continuation of that effort, cooperation and a positive relationship. So, now I know, when the baby grandchild begins talking and says a word, I should repeat it and talk about the word, not jump up and down and do a silly dance as I was inclined to do? This is a perfect time for this Grandma to go back to her mantra. Grandparenting is all joy and no responsibility. This is one blog to pass along to the parents of the grandchildren for them to learn how to apply the new norms on praise on a daily basis. For me, I will stick with the one sentence that has stuck in my mind and I can remember. . . .
Whatever the grandchild has done is a good job. I do want them to become dependent on this Grandma’s praise. Isn’t it our grandparent job to show them unconditional love whatever they do? And it is easy to praise our grandchildren, in vivid detail, as to how even their huge poop or finishing all the cake on their plate is the best. TMI. Too much information and too much responsibility other than to remember I cannot say “good girl” or “good boy” or I can expect to get a dirty look from a parent of my grandchild. Do I care?